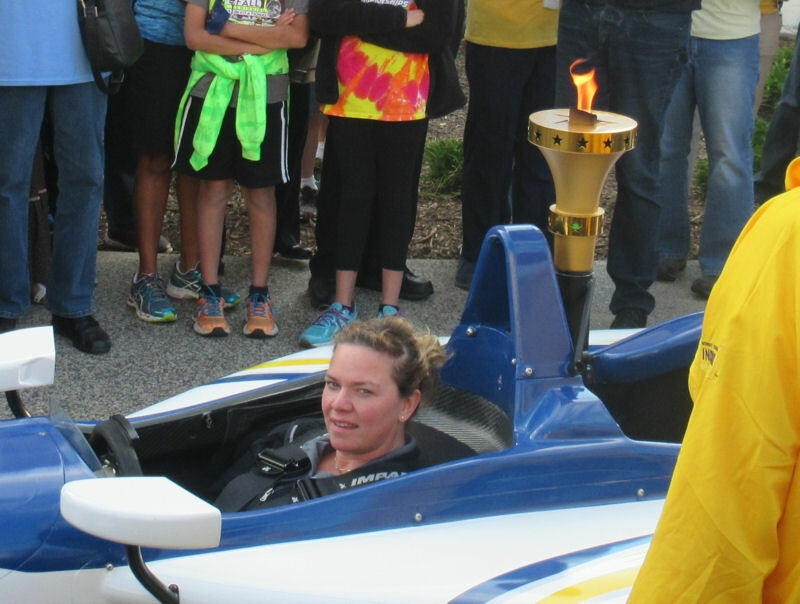 Hoosier Homecoming Photos #2: The Indiana Bicentennial Torch Relay Finale « Midlife Crisis Crossover! Speedy delivery from former Indy 500 driver Sarah Fisher! 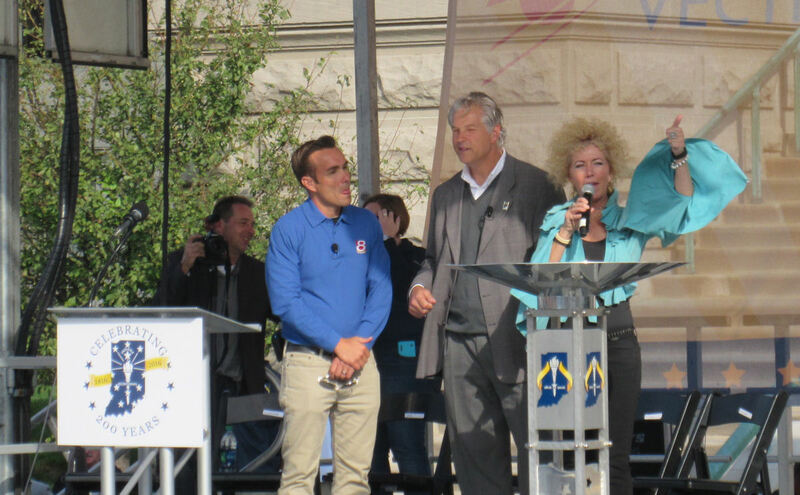 On October 15th, downtown Indianapolis hosted a very special convention of sorts. The “Hoosier Homecoming” was a celebration held at the Indiana State House in honor of Indiana’s 200th birthday, with a host of well-known local faces in attendance, an opportunity for self-guided tours of the State House, and the closing ceremonies to the Indiana Torch Relay, a 37-day event in which a specially lit torch — not unlike the Olympics’ own, but inspired by the torch on our state flag — traveled through all 92 Indiana counties by various transportation methods until its final stop in Marion County at the Homecoming. Setting the Indiana government spaces we toured and the politicians we didn’t expect to meet in person, the main event was the culmination of the Torch Relay, the most ambitious and far-reaching commemoration of the Hoosier State’s big 2-0-0. It’s likely we’ll never host the U.S. Olympics in my lifetime, so this is as close as many of us will get to an ostentatious, meaningful torch. 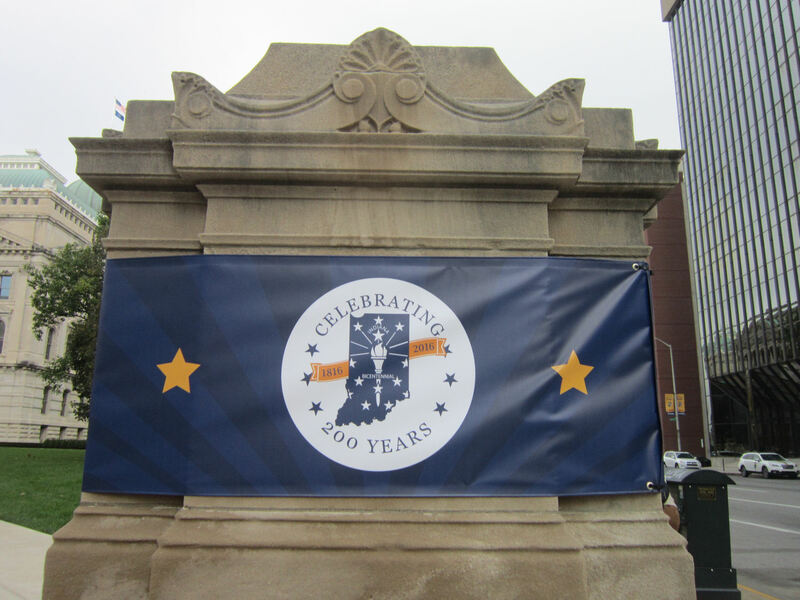 The occasion gave rise to a few different advertising designs, including this large banner mounted at the southeast corner of the State House grounds. The main stage was on the west end of the State House. You’ll see a better view of Indiana’s capitol dome in a future chapter, to go with the other capitol domes we’ve showcased our our road-trip travelogues. 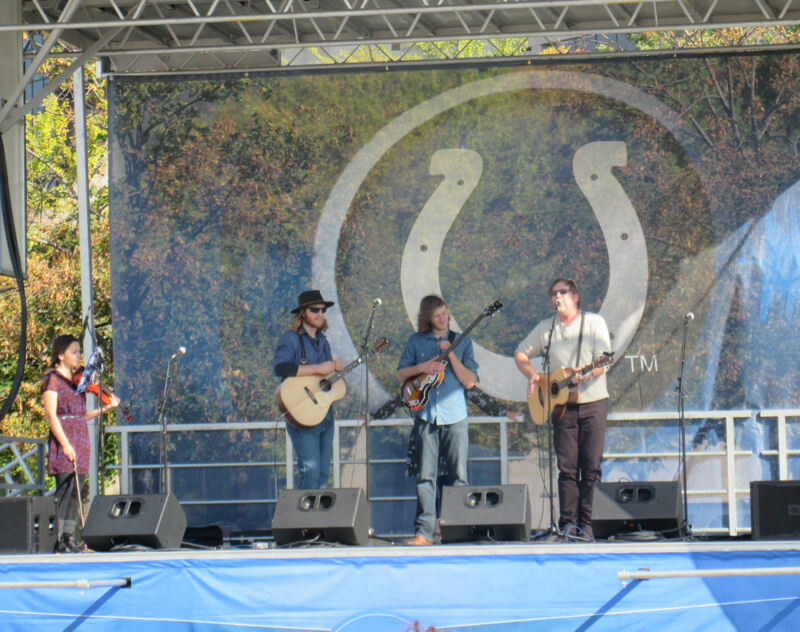 Three stages of varying sizes around the Homecoming hosted musical performances from a variety of local acts. Sadly, we saw no surprise appearances from marquee names with Indiana roots such as John Mellencamp, Florence Henderson, David Lee Roth, Axl Rose, that one guy from Days of the New, or any of the Jackson family. The one voice with which I was least unfamiliar: the eminently bluesy Jennie DeVoe, who’s been a fixture here in Indy since the late ’80s. She’s also performed the National Anthem at the Indy 500 on multiple occasions. Unfortunately the acts never seemed to line up with the schedule we were given, so I have no idea who this was, performing around 3 p.m. at the north stage. 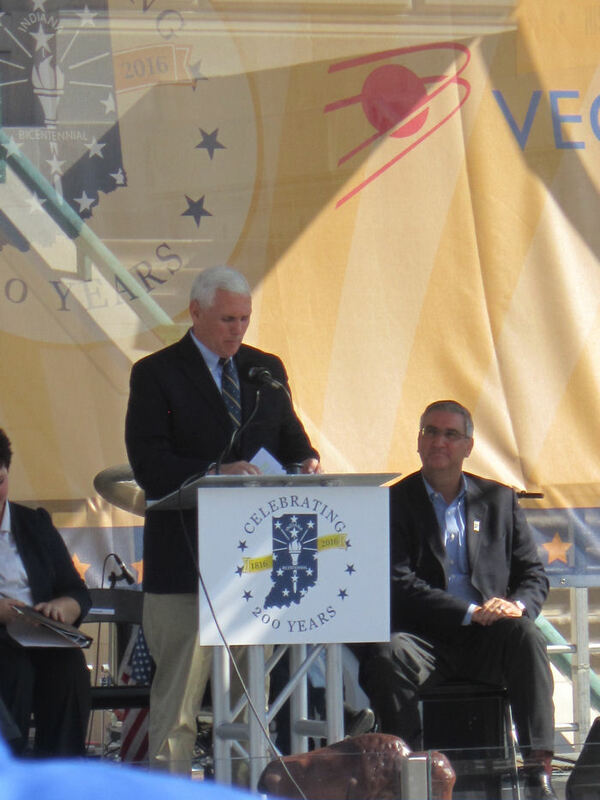 If either Indiana Governor Mike Pence or Lieutenant Governor Eric Holcomb had been there to sing, I would’ve been ALL about taking some amateur video for posterity. 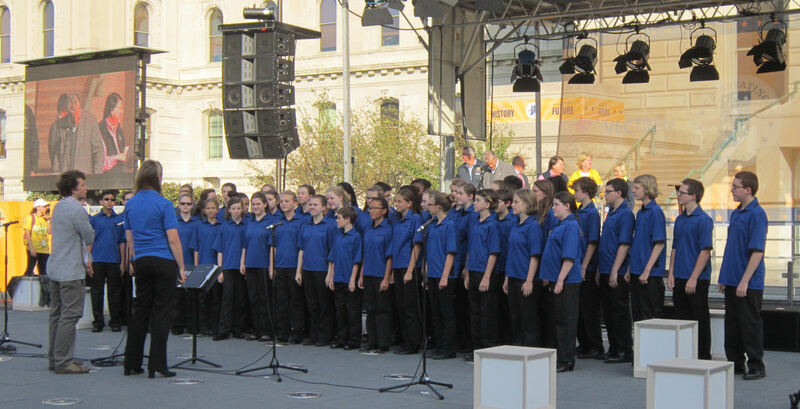 The penultimate act in the ceremony: mandatory children’s choir! Neither they nor the closing act were named, either during the ceremony or in the Homecoming’s official program. 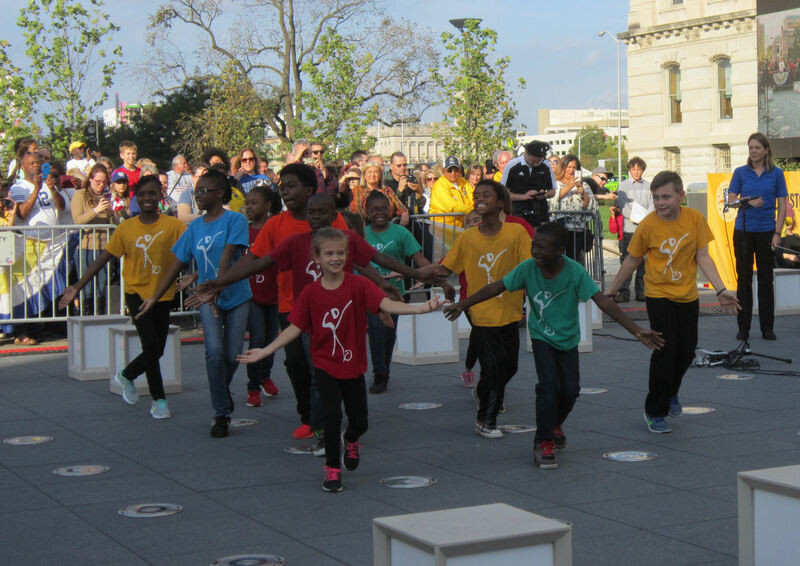 That closing act: the Indiana Bicentennial Dancers! 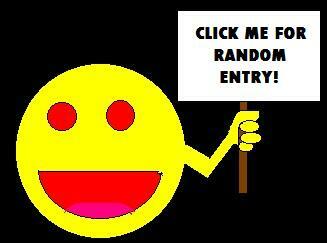 Good, infectious fun. 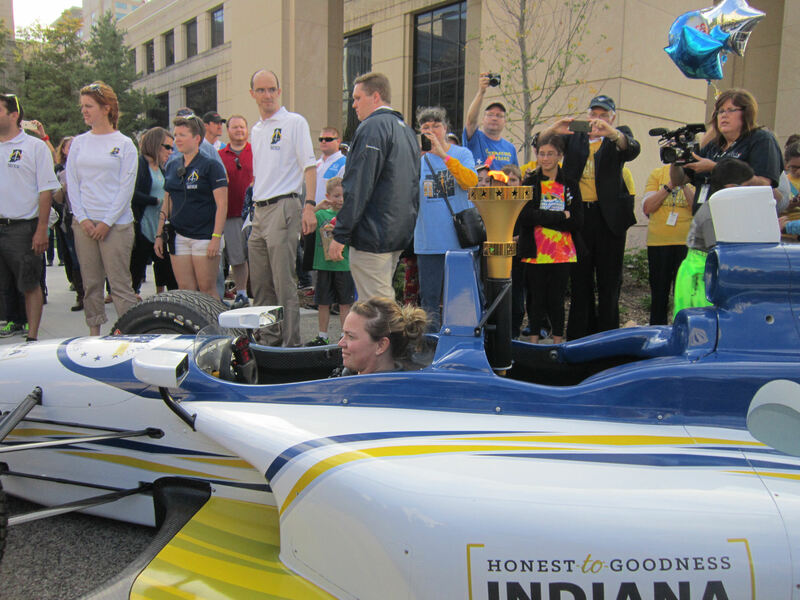 After traveling through all those counties in a variety of transportation modes — via runners, racecars, trains, motorcycle sidecars, horses, olde-tyme autos, boats, and more — the last stretch across the Robert D. Orr Plaza was navigated courtesy of Sarah Fisher, a nine-time driver in the Indy 500 who now owns her own racing team, along with a kart track and restaurant in Speedway. The Instagram crowd parted like the Red Sea to let Fisher pass through at a safe, non-racing speed. 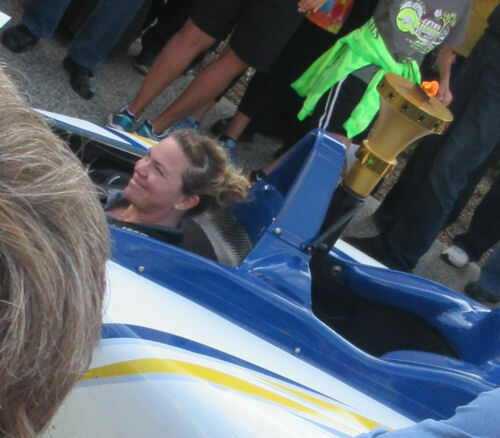 Our best shot of a smiling Sarah Fisher was unfortunately shot through an inadvertent Batman ’66 filter. Fisher parked her Dellara 2-seater a hundred feet or so from the stage. This was our best glimpse of the racecar’s special Indiana Bicentennial paint job. 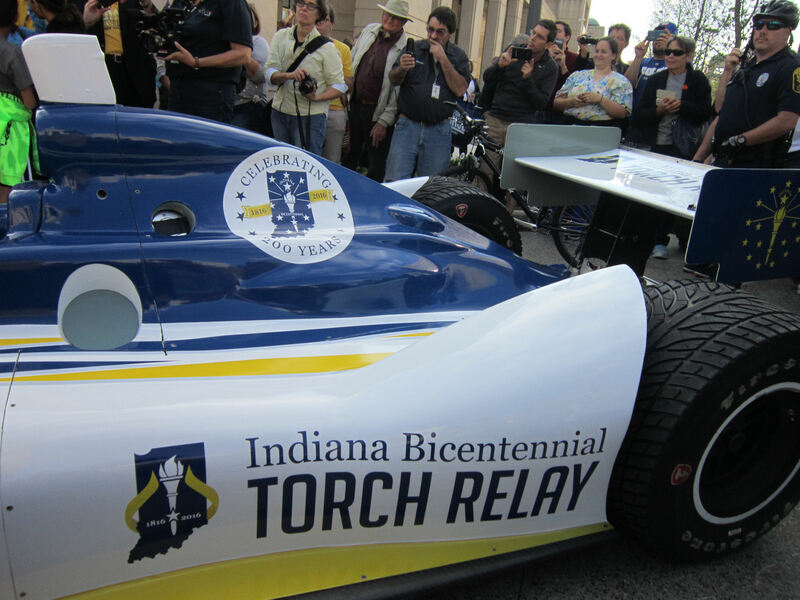 The torch on the tail fin is closest in appearance to the actual Indiana state flag. 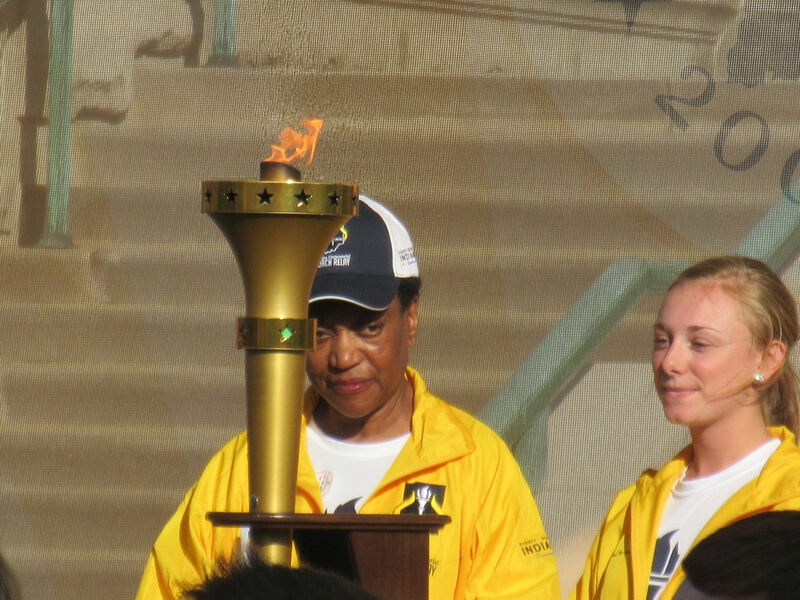 From there, one last young runner removed the torch from its mount, carried it onstage, and lit a larger, even more ceremonial torch with the assistance of other helping hands. And thus did thirty-seven days of road-tripping torch conclude in a special moment for the state of Indiana and those of us grateful to watch and to call Indiana home. The torch on our flag is okay at symbolizing liberty and freedom and whatnot, but this one is shinier and has real fire. In retrospect, if it were up to me, future Indiana tourism campaigns would be centered less on corn, covered bridges, or down-home folksiness and more on our sparkly and potentially weaponizable flag torch, but that’s just me. 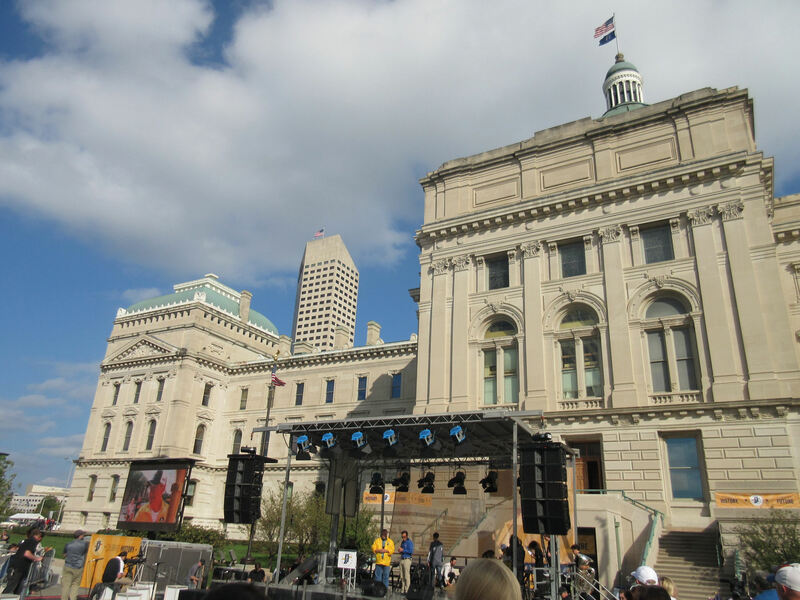 Pingback: Hoosier Homecoming Photos #1: Adventures in Local Government | Midlife Crisis Crossover!